Product prices and availability are accurate as of 2019-04-22 10:01:59 UTC and are subject to change. Any price and availability information displayed on http://www.amazon.com/ at the time of purchase will apply to the purchase of this product. Covering the U.S.A. and Canada like never before, and for the first time with full-color photographs, here are 1,000 compelling, essential, offbeat, utterly unforgettable places. 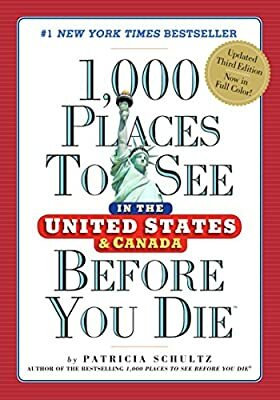 Pristine beaches and national parks, world-class museums and the Just for Laughs festival, mountain resorts, salmon-rich rivers, scenic byways, the Oyster Bar and the country’s best taco, lush gardens and coastal treks at Point Reyes, rafting the Upper Gauley (if you dare). Plus resorts, vineyards, hot springs, classic ballparks, the Talladega Speedway, and more. Includes new attractions, like Miami’s Pérez Art Museum and Manhattan’s High Line, plus more than 150 places of special interest to families. And, for every entry, what you need to know about how and when to visit.